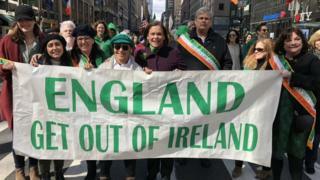 Sinn Féin president Mary Lou McDonald has been criticised after she posed with a banner reading ‘England get out of Ireland’. Irish Tánaiste (Deputy PM) Simon Coveney described the banner as “offensive, divisive and an embarrassment”. Sinn Féin said the criticism was “faux outrage” and “political point scoring”. The photo was posted on Twitter by Sinn Féin’s official account along with the caption “no explanation needed”. Ulster Unionist leader Robin Swann called for an explanation, and said the poster was “high offensive and wrong on so many levels”. DUP MP for East Londonderry, Gregory Campbell, said: “When slogans such as “Brits out” or “England out of Ireland” are used the unionist community are well within their rights to see themselves as the intended focus. A Sinn Féin spokesperson said: “It should come as no surprise that Sinn Féin wants a new United Ireland under the provisions of Good Friday Agreement. Ms McDonald was one of a number of politicians from Northern Ireland and the Republic of Ireland who were in the United States for a range of events in the run up to St Patrick’s Day. Taoiseach (Irish Prime Minister) Leo Varadkar and Democratic Unionist Party (DUP) leader Arlene Foster were among those who travelled to the US.